Established in the year 2009, at Mumbai (Maharashtra, India), we, “Chromatography World”, came into existence with its objective to provide a wide range of Chromatography Products under one roof. We are also committed to providing the best possible services with respect to prompt supplies enabled with competitive prices. We look forward to you to offer us an opportunity with your valuable inquiries and allow us to offer you the best services. To store our products in a safe and organized manner, we have constructed a modern and spacious warehousing unit. Facilitated by the smooth inventory management system, we have classified the entire unit into various sections so as to store products as per their categories. Our warehousing unit is administered by our skilled warehousing personnel who carefully manage the entire database of products. Our warehousing team is trained in standard warehousing procedure and specific methods to handle these products. We deliver these products in fine packaging material in order to ensure safe transit at the clients’ destination. Being a quality-oriented organization, our main objective is to satisfy our clients by offering them superb quality products within the stipulated time frame. Our ethical business policy, transparent dealings, client-centric approach, and easy payment modes have reached us the peak of success. Manufacturing and Trading of Chromatography Products. Since we understand the value of timely treatment for any illness, we are completely present and aware of timely supplies for the range of chromatography and other consumables having application in critical areas or otherwise. Our Mission lies in Customer Satisfaction. With rich industry experience, we are aimed at offering high quality products. Manufactured by our certified vendors using superior quality raw material and leading-edge technology, these products are highly durable and guaranteed of their quality. By keeping in mind clients' satisfaction factor, we try our level best to understand their exact requirements and offer them products accordingly. Besides this, our on-time delivery, wide distribution network, transparent dealings, client-centric approach and competitive prices enable us to develop a huge client base across the world. To become the leader in the field of Chromatography and Analytical Supplies with highest no. of satisfied customers. Assisted by our experienced procuring agents, we have selected the authentic vendors that hold vast industry experience, good reputation, and strong financial background. These vendors are known for practicing transparent dealings and ethical business policies. Our vendors help us meet the urgent and bulk orders of customers in stipulated time-frame. To maintain a long-term relationship with these vendors, we procure the entire range as per the industry defined guidelines. 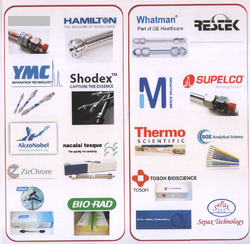 Our strength is to offer you chromatography products including HPLC Columns, Capillary Column, Various Consumables and Spares of most major brands and also S.S & Glass Pack column at the most competitive price with superior service. Since our establishment, we are firmly committed to providing a qualitative range of products. We export our products all over the world.